Getting a baby to sleep through the night without feedings might be one of the most anticipated moments in the lives of new moms. Going back to a full night’s sleep is high on anyone’s wish list! 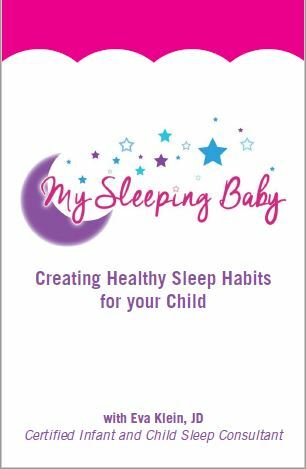 The main question here is: how can a parent get themselves a full night’s sleep without putting their baby through too much stress? One of the moms in the My Sleeping Baby Facebook Community group wanted to know when can a baby sleep through the night without feedings? She specifically wanted to know how she can get her 8-month-old to stop waking up for feedings at night. Great question! 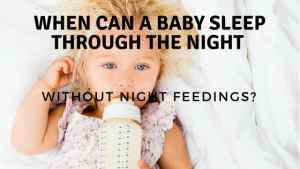 Two main questions need to be answered when it comes to night weaning: 1) when is this possible; and 2) how the heck do you do it? Is sleep training and breastfeeding even possible? Spoiler alert- yes, it is! Since babies can be very different from each other, this question has no right answer. I’ve seen babies that required no night feeds after they turned just 4 months old. I’ve also seen babies that were almost 10 months old and still woke up nightly to be fed. The medical community agrees that a healthy baby is typically ready for an uninterrupted night’s sleep after they turn 6 months old. As a sleep consultant myself, I’ve never had a problem weaning a baby over the age of 7 months from all night feeds as long as that baby was healthy. Again, I can’t stress this enough that there is no absolute rule here. Every situation is different! My baby is ready to be night-weaned. Great. Now how do I stop him from waking up at night to eat? Now that you’ve decided it’s time to end the night feeds, the only rule you need to remember is that you should remove these feeds gradually (though not TOO gradually). Never, under no circumstance, go cold turkey and remove full feeds completely, especially if you’re sleep training and breastfeeding. If your baby is used to waking up and eating quite a bit at night, you’ll have a genuinely hungry and frustrated baby. We all know that spells trouble! Instead, you’ll want to gradually transfer the night intake of calories to the day. You can do that by shortening the night feeds by 1 minute each night. It’s a number small enough for the baby not to get cranky and big enough to keep the process short from start to finish so you can enjoy those peaceful nights again. So for example, if your baby takes 10 minutes to breastfeed, next time spend only 9 minutes feeding him. The following day, spend only 8 minutes feeding him, and so on. If your baby is bottlefed, simply decrease the amount she consumes per night and then offer her one ounce less every night. I want to caution you to make sure that your baby is waking up during the night solely on account of being hungry and there’s nothing else going on. There are many reasons babies constantly wake during the night that have nothing to do with hunger- overtiredness and sleep crutches are just two of them! So just remember that getting a baby to sleep through the night without eating isn’t always as simple as implementing a night weaning strategy. You’ll want to have a bigger sleep plan in place!